← Low production affects separation plants … to put it simply: evo failed! Rivera, her father and brother emigrated from Bolivia when she was 7, just three years after her mother’s death, when the University of California Davis offered her father a position as a Latin American literature professor. “It was supposed to be for just two years, but we ended up staying because one opportunity after another came up for my dad,” she said. To learn English, Rivera said teachers pulled her out of class to watch “Sesame Street. When you’re 7, it doesn’t take long to learn,” she laughed. After a few years, her father accepted an appointment at Louisiana State University, and seven years after that, the family moved again for her father’s next position at the University of Tennessee, Knoxville, where Rivera received her degree in communications. Following graduation, she took a job with the News Journal in 1993 to cover Delaware’s immigrant community. “It was a new beat created because the Latino community was just beginning to grow,” she said. Rivera met Sisters Ascencion Banegas, Rosa Alvarez and Maria Mairlot, the nuns who would go on to found La Esperanza in 1996, when they first arrived in Sussex County. “I got to see the dedication they have for their community,” Rivera said. “And last year, we had a retirement party for them. They are the heart and soul of La Esperanza.” La Esperanza provides free family development, immigration, victim services and education programs for Hispanic adults, children and families. She also saw the founding of La Red Health Center, which evolved from a hotline referring callers with limited or no English to bilingual providers offering discounted rates, into a medical center offering a full range of health services in locations throughout Sussex County. In 2000, Rivera took a job as a business writer for the Dallas Morning News, which lasted only a couple years. “I was traveling a lot, and because I lost my mom, I wanted to be more a part of my children’s lives and didn’t want to be away so much,” she said. So, Rivera launched a translation agency from home, working part time while continuing to freelance as a journalist. She and her family returned to Delaware and bought back the same house she sold before moving to Texas. Rivera continued to provide translation services to businesses, hiring only certified translators for her agency. She also taught English at Delaware Technical Community College. When she found her clients needed help with writing as well as translation, she created Hook PR & Marketing, a virtual agency of professionals offering brand strategy, web design and marketing campaigns along with bilingual marketing and translation services. “I focus on helping the changemakers, the nonprofits, social enterprises and state agencies who are trying to solve issues with innovative solutions,” she said. Clients include Kind to Kids Foundation, Telamon and Delaware Department of Education. 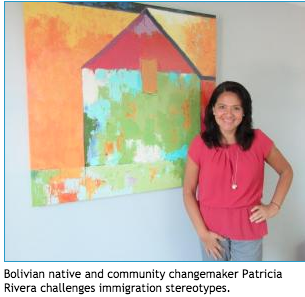 With Rivera’s children now older, she has more time to be a changemaker herself. Rivera is board president of La Esperanza and a board member of Delaware Alliance for Nonprofit Advancement. She was appointed to Delaware Hispanic Commission and speaks at events for social and nonprofit causes. Rivera is excited about La Esperanza’s upcoming Sabor Latino 2018 Sunday, Oct. 14, at the Clubhouse at Baywood. “The event will showcase Latino chefs who have influenced coastal cuisine in the Cape Region, and Latino artwork. There will also be salsa and tango dance lessons, and a silent auction,” she said. Rivera lives in Lewes with husband Mike McClure, Morningstar Publications publisher and editor. Her children, junior Miranda and eighth-grader Rafael, attend Sussex Academy of Arts and Sciences. Rivera said her beach bum, Rafael, wants to make surfboards when he grows up. Miranda wants to study immigration law to help solve immigration problems for children. Rivera pointed to fellow immigrants like Kevin Andrade, who emigrated from Ecuador about 2003 and is now president and CEO of Voice Radio Network. This entry was posted in Bolivia and tagged Bolivians abroad. Bookmark the permalink.